When I joined the WI three years ago, I couldn’t have imagined the places it would take me; and certainly not on a 185-mile trek from Liverpool to Hull with four other WI members! Over nine days our group met 85 members from 30 different WIs in 8 federations, and raised over £3,500 for the Saving Denman Appeal. Last year, I watched comedian Jo Brand take on the Trans Pennine Trail for Sport Relief. I immediately texted Anna Kidd and Louise Checkley, fellow N1 WI members and coordinators of The WI Walks (our walking group which doubles as a Facebook page promoting walks led by WI members), to suggest this as a potential fundraising challenge to support the recently launched Saving Denman Appeal. Having announced our plan on Facebook in January 2017, we were surprised and delighted when two other WI members, Barbara Bailey from Briz Valley WI, Derbyshire Federation, and Helen Ebbitt from Norley WI, Cheshire Federation, who we had never met before, wrote asking if they could join us on this adventure. Training started in earnest in February, and we walked every weekend for three months, increasing distance and difficulty each week to build up our strength and endurance. Even for regular walkers like us, walking over 20 miles per day was a massive challenge. In the meantime, we contacted WIs close to the Trail, asking for help with food and accommodation. Our requests were, again and again, met with incredible kindness, positivity, and friendship. In the end, we were hosted by WIs every night of our nine-day trek. The generosity of these women meant that we could afford not to reimburse ourselves any expenses, so every penny of fundraising has gone directly to Denman. 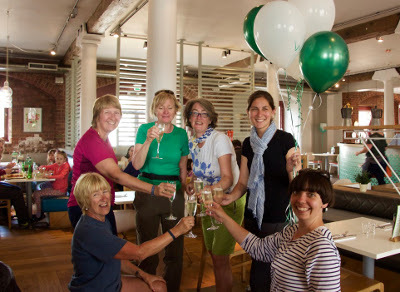 From the moment we arrived at Runcorn station on 26 May, until we were waved off at Hull station on 4 June, we received boundless support and friendship from WI members. We were made to feel welcome in homes across the country and members went out of their way to be helpful; they washed our clothes, dried our boots, gave us foot baths and blister plasters for our aching feet, and sent us off in the morning with sandwiches and cakes to power us through the longest days. I am truly humbled by the genuine hospitality we received. Other members also came to join us for a few miles or a cup of tea to show their support. Best of all was having the opportunity to meet and get to know so many interesting and impressive women from across the country. Walking and sharing a meal are the best ways to generate sincere conversation, and we did both of those in abundance! We shared stories and life experiences, we discussed politics and (of course) the weather, and we spoke about what the WI means to each of us. Almost everyone I met told me unprompted that joining the WI has changed her life for the better, a sentiment with which I can only agree; I’ve returned to my own WI excited and full of ideas. I am so proud to be a member of the same organisation as all of the kind, thoughtful, and inspiring women I met on this journey. So far, our Just Giving page (justgiving.com/fundraising/TheWIWalksHiketheTranspennineTrailforDenman) has received £2,165 which, added to the £200 in cash donations we received during the walk and the extraordinary £1,300 raised by Barbara, means we have been able to donate over £3,500 to help save Denman for future generations. I am so thankful to everyone who donated money, followed our journey online, walked with us, and hosted us for making this achievement possible. It feels wonderful to give back to an organisation that has given me, and all of us involved, so much. For more information and photos from our Trans Pennine Trail challenge, and to learn about upcoming walks, find us on Facebook at facebook.com/TheWomensInstituteWalks.